2 Lermontovsky Avenue, Saint Petersburg (tel. : +7 812 713-81-86), Metro station: "Sennaya Ploshchad'", "Sadovaya", "Spasskaya". The Jewish community played a significant role in the development of Russia and its new capital, St. Petersburg. Despite an order by Catherine I, according to which the Jews were prohibited to reside not only in St. Petersburg, but also throughout the whole country, they still came to the capital for a short time. During the reign of Empress Anna of Russia, even severer decree was signed demanding to exile the Jews from Little Russia. Later, Catherine II allowed some Jewish people to live in St. Petersburg for the benefit of Russia; however it was still prohibited for other Jews to come to the capital city. After Poland was partitioned, Russia obtained wide lands populated by the Poles, Lithuanians, Belarusians, Ukranians, and Jews. In the late 18th century, the Jews visited Petersburg very often. It was the same time when the first Jewish community was formed in the city. Its main representative was a big industrialist Abram Peretz. In 1802, the Jews bought from the Lutheran community a plot of Volkov cemetery for their burials. The history of St. Petersburg Jewish community keeps its official count since this date. When Emperor Alexander II ruled the country, the Jews (retired soldiers, merchants, people with academic degrees and university graduates) were given a permit to reside anywhere in Russia including St. Petersburg. This right was also granted to their families and specified number of stewards and servants. The Jews were allowed also to invite rabbis from other cities. On 1 September 1869, the Cabinet of Ministers approved a resolution allowing St. Petersburg Jews to build a synagogue. A construction committee was elected as early as 11 September. It was headed by Horace Ginzburg. An appropriate place to build the synagogue was searched for ten years. Finally, on 16 January 1879, the Jewish community purchased a house and an adjoining plot of A. Rostovsky in Bolshaya Masterskaya Street. In July of the same year, a construction contest was announced. A design was made by architects L. Bakhman and I. Shaposhnikov with the assistance of Vasily Stasov and Nicholas Benois. On 16 May 1883, Alexander II approved a draft design of the future synagogue. The construction committee was chaired by Alexander Kaufmann. The construction process itself was supervised by A. Malov and his assistants S. Klein and B. Girshovich. In 1884, Nicholas Benois was appointed a construction supervisor, while the committee was led by Samuel Polyakov. In October 1886, the Small Synagogue was consecrated and housed the Temporary Synagogue until the Grand hall was opened. In 1888, the Grand Synagogue was finally constructed. However, in the next five years the interior decoration took place. Finally, on 8 December 1893, the ceremony of official consecration of the Grand Synagogue took place. The building was built in accordance with ancient architectural traditions. The central part is decorated with an avant-corps (risalit); a portal has an arched shape with paired columns. Corner risalits are smaller than the central one. The building is crowned with a spherical dome. The Synagogue's entrance hall is acoustically unique — one can hear whispered words at a distance of more than ten meters. The main room features a chandelier, which was originally a gas lamp. Lately it was made electrical, reconstructed, and re-plated with silver leaf. In 1909, ramshackle wooden fence along the building was replaced with granite blocks with metal grid. By the decree by Presidium of Leningrad City Council (Lensovet) of June 29, 1929 Jewish religious community was liquidated. On 17 January 1930, the Executive Committee of Leningrad Region (Lenoblispolkom) decided to close down the Grand Choral Synagogue. 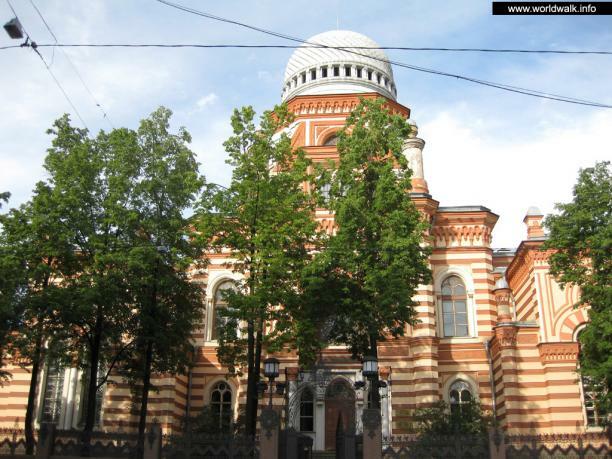 But after Jews complained to VtziK (All-Russian Central Executive Committee), the supreme legislative body of the state at that time, the synagogue was re-opened on 1 June 1930. On the threshold of Olympics-1980 held in Moscow, Leningrad, and Tallinn, Leningrad Synagogue got into the number of the main sites of interest. That is why in 1978 the state allocated considerable resources to its repairs. The reconstruction works were supervised by K. Plotkin. In 1991 upon the initiative of the Shamir society a Jewish Day school was launched at the Synagogue. The Grand Choral Synagogue is orthodox. It means that men and women should pray separately and do not distract each other from God. There is a special gallery for women upstairs. Male chorus is in the balcony above the women's gallery. Books of Torah are stored within the Synagogue. They are handwritten on parchment by one person for several months. If a mistake or correction is made, the scroll must be written anew from the beginning. In 1998, reconstruction was started. This very important project was initiated by the Community leaders represented by the chief rabbi of St. Petersburg M. -M. Pevzner, the chairman of the community M. Grubarg, and the deputy chairman and restoration project supervisor T. Sepiashvili. The reconstruction became possible thanks to handsome donations by Edmond Safra, as well as L. Levaev, V. Kogan, Z. Smushkin, G. Scherbakovsky, and T. Bolloev. Today, the Synagogue is a cultural community centre for all Jewish people living in St. Petersburg. The Grand Choral Synagogue is an architectural monument of Federal importance and the second largest synagogue in Europe.